With more critical reading coverage than any other composition reader, Reading Critically, Writing Well helps students read for meaning and read like a writer, and it guides them to use what they've learned in their writing. Each of the book’s 8 assignment chapters includes a specific guide to reading that challenges students to analyze the authors’ techniques as well as a step-by-step guide to writing and revising that helps them apply these techniques to their own essays. Now with more readings in each chapter, including 17 provocative new professional selections and student models covering a range of disciplines, this new edition features hands-on activities for critical analysis and invention, helpful reading and research strategies (including 2016 MLA coverage), and multiple opportunities for summary and synthesis. 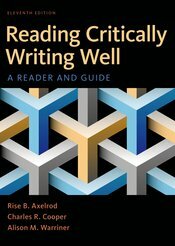 Accessible instruction, engaging readings, and effective writing assignments make Reading Critically, Writing Well ideal for instructors who want the support and readings to demonstrate effective rhetorical choices that students can make in their own writing.